When printing and packaging bibles, the foremost concern is of quality. We at Ad Industries understand that a bible serves the dual function of a keepsake and a utility. We provide incredibly beautiful yet stylish bibles that are easy to hold and read during mass. All the little details that can make a bible special are included in these bibles. 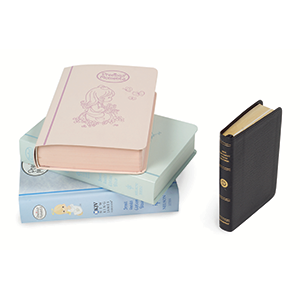 Ad Industries provides bibles that are bound in Reese and Freeman cases to provide flexibility and protection to the pages inside. The covers can also be crafted using genuine leather or bonded leather. Hubbed spines are introduced in bibles for an elegant and traditional feel. Each bible features a high quality ribbon marker that is incorporated into the book during the binding process. This ensures that the ribbon does not fall out of the book. Three high-speed automatic gilding lines are used for round corner gilding. We also provide coated and uncoated stock gilding. These bibles can feature round or square corners. The bibles can be custom packaged according to any client specifications. We understand the emotional value of a bible and hence employ only such methods and materials that ensure the highest quality and durability. We are dedicated to providing our clients and users with an experience that can be cherished for years. All our clients also have access to our immense bank of knowledge and experience. We have been in this industry for over 30 years, and provide our patrons with guidance regarding technology, materials and even decorative techniques. With a broad range of service under one roof, it is no surprise that we are the preferred choice for products that need to be crafted and provided with care.